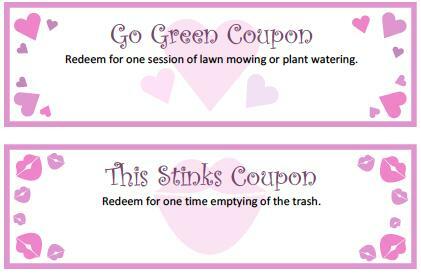 Click to print Valentine's coupons. Kids have fun creating cards to pass out to their friends at school and give to family members for the holiday. Whether you want to make a craft or offer a heart-felt card, there are plenty of ideas to choose from. Incorporating fun craft activities into card making makes the holiday extra special. Click the link in any of the images to get a printable version. If you need help printing any of the projects, see the guide to working with adobe printables. Kids can use their creativity by designing homemade coupons to do something special for a family member. Decorate the cards as desired. Cut them out and slip them inside an envelope. The coupons also give kids and adults a fun way to spend quality one-on-one time together. Creative cards don't have to be stuck inside an envelope. 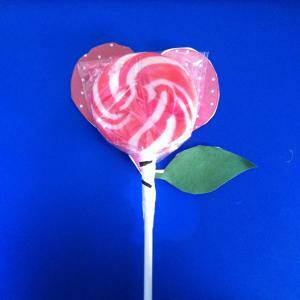 Create a heart lollipop flower to give as a Valentine. 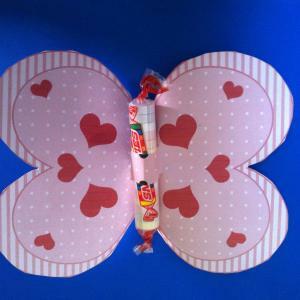 Place a flat lollipop on plain card stock, or an index card, and draw a heart shape around it. The heart shape should be slightly bigger than the lollipop. Cut this shape out to use as your template. 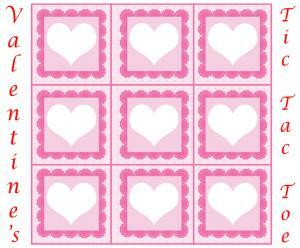 Use the template to trace and cut out the number of hearts you need for your Valentine's Day cards. Use construction paper, or other heavier paper to make sure the finished product is sturdy. Draw leaves on green construction paper and cut them out. Decorate one side of the heart with the person's name using markers or crayons, and paste green leaves at the base on the other side. Tape the lollipop on the leaf side of the card, creating a heart-shaped flower with the person's name and message on the other. 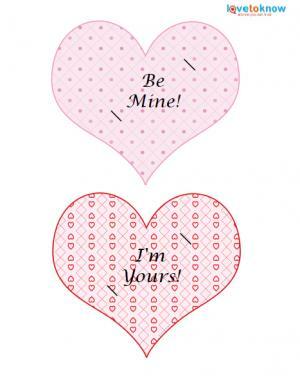 Click to print the lollipop hearts. Have the kids draw out a heart shape from folded pieces of construction paper. Assist the kids in cutting the hearts out. Open the heart, and mark where the pencil will be placed. Cut slits at the marks. 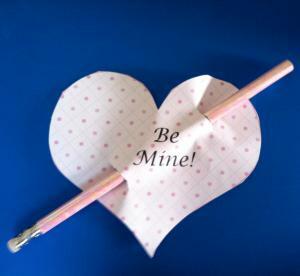 Have the kids decorate the hearts as desired, and insert the pencils at the slits. Click to print this Valentine. It's easy for kids to make cards that resemble beautiful butterflies. All they need is card stock and a lollipop or another cylindrical candy, like Smarties. Use heavy-duty paper to draw two overlapping hearts. These are the butterfly wings. Cut the wings out, so that you have one piece. Punch holes in the center to insert a lollipop or smarties. (If you want to skip this step, you can just tape candy to the center. Slip the candy through the two holes in the card. Fold both "wings" in toward the lollipop body. Decorate as desired, writing the giver's name on one wing and the recipient's on the other. 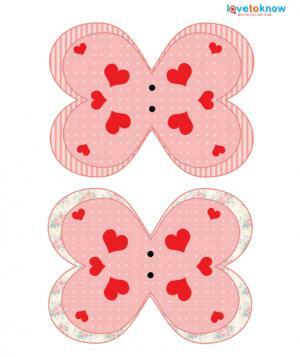 Click to print the buttefly template. Everyone loves a friendly game of tic-tac-toe. Combine it with candy for the perfect Valentine combo. Create a simple tic-tac-toe grid using the line drawing tool in your word processing program, or using the printable. Print it on card stock and decorate it. Staple a fun-size bag of M&Ms, Skittles or similar candy to the board to use as playing pieces. Click to print the game board. Transform plain card stock into quick Valentine's Day cards with simple ideas. A stack of inexpensive blank cards can be transformed into handmade Valentines using paint and plain doilies. Fold small paper doilies in half; just smaller than the card itself. Decorate the solid part of the doily using markers, crayons, stickers or glitter glue. Write a special message on the inside, and glue the doily on the outside of the card to finish. Draw a circle on the front of a blank card and color it in. Draw a line down from the bottom of the circle to the edge of the card. Cut out petals from different colored card stock in teardrop shapes. Glue the teardrops around the circle, creating the petals around the flower. 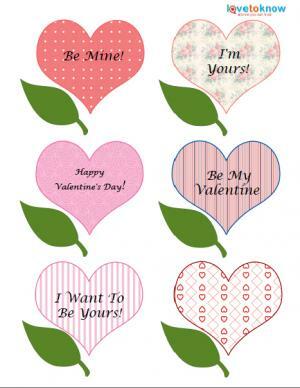 Valentine's Day cards can quickly be made from printed Valentine's designs. Print out different card templates saved on the computer and fold into card shapes. Cut out a one by five inch strip of card stock and fold it accordion style. Glue an image to one end of the strip and glue the other end to the inside of the card. When you open the card, the image will pop out at you, creating a fun effect. Draw a heart on the front of the card using school glue. Pour red or pink glitter over the top of it. Shake off excess glitter and let the card dry. Then add your Valentine's wishes. Inside blank Valentine's Day cards, have the kids write a fun quote, or have them write their own poem. Simple shapes make great cards and are easy enough for the kids to create. Even when the project is simple, creating original Valentine's cards inspires holiday creativity in kids.